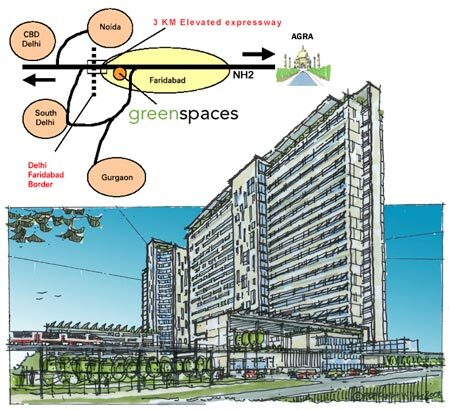 GreenSpaces is a 1.75 million square feet LEED© certified ‘Super’ Platinum Green Building and approved SEZ Information Technology Park, located only 6 kilometers (3.7 miles) from Delhi on the Faridabad border on National Highway 2 to Agra -- close to both NOIDA & Gurgaon. Buildings today account for 40% of total global energy usage. Our mission is to reshape the way commercial buildings are designed and built, with a view to reduce impact on environment and contribute to social development and sustainability. GreenSpaces will demonstrate that via technology, lifestyle changes, and design that one can economically reduce the energy consumed by buildings from 40% to 10%, and in the process prove that "Green is Green" and therefore sustainable and replicable. In our mission, we're supported by the best possible team of over 30 project implementors and technology partners like General Electric, Carrier, Otis, IBM and ITT, and a world renowned Hon. Advisory Board. GreenSpaces is being promoted by the management of Paharpur Business Centre & Software Technology Incubator Park (PBC™ - STIP). Known for its exceptional indoor air quality, high security and state of the art IT connectivity, PBC™ - STIP is also rated by the CPCB (Government of India) as one of the healthiest buildings in Delhi to work in. Construction is scheduled to start in 2010 and will be ready for occupation by the middle of 2012 as a plug and play five star fully furnished and equipped facility.